HOW DOES THE TUN TAVERN VIRTUAL RUN WORK? Celebrate the Marine Corps Birthday and its 244 years of existence with this monumental event! Register for the event, run a 10K or 10 Miler between November 6th and 11th, and you will receive your package a few weeks later! All virtual race packages will be shipped by the end of November. You will complete your run with honor and commitment (we aren’t your momma and we won’t be checking in with you to make sure you did the distance you said you would). This allows you to complete your distance at a location of your choosing, and you can run anytime you’d like (Cadence optional but highly recommended). · A chance to support America’s finest fighting force and their morale programming aboard MCB Camp Pendleton. This momentous medal captures the iconic motif of the birth of the Marines. The date on the medal, November 10, 1775 is the birthdate of the Marines. The center logo is the original Marine emblem for the Continental Marines which dates back to 1775. It depicts a fouled anchor which is indicative of the amphibious nature of the Corps; atop the anchor is the crested eagle which symbolizes a proud nation. The original eagle was a crested eagle (which is a species found throughout the world) rather than an American Bald Eagle. The eagle and anchor are placed under a semi-circle of 13 6-pointed stars which represent the 13 American Colonies. 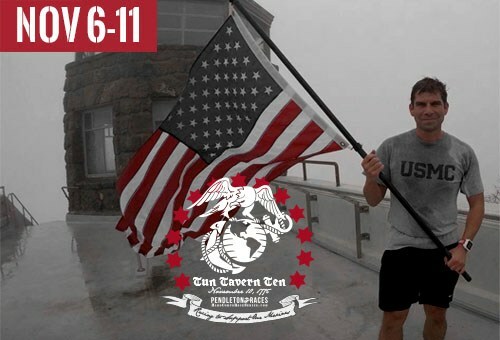 The emblem is backed by a beer stein, signifying Tun Tavern as well as each of the plank holders or originators of the Continental Marines. This medal features a bottle opener to help you celebrate with us on the Historic Birthday of the United States Marines!